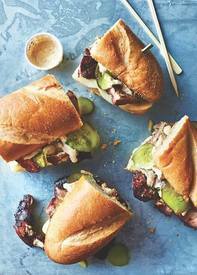 Hit your favorite barbecue place or your supermarket for the ready made smoked pork for these sandwiches, and then make them at home! One of my favorite parts of the Cuban Sandwich is the pickles...I'll take extra, extra pickles on mine! !